A time capsule found under the granite stairs of Lebanon City Hall a few weeks ago was opened Wednesday night. Ed Ashley Curator of the Lebanon Historical Society and Lebanon Historian opened the whiskey bottle time capsule along with Lebanon Mayor Georgia Tuttle MD. Inside the bottle was a 1941 penny, old newspaper articles and a scrolled note from Sam Stevens, a former Lebanon selectman. The note was dated June 10 1944 and spoke of WW II, the quality of the steps being built, and that he buried bottles throughout the City. 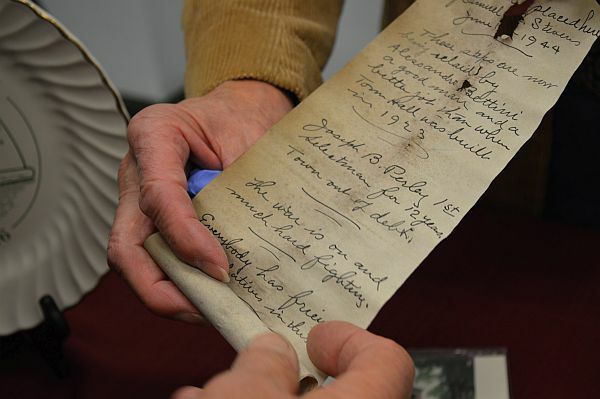 Stevens also mentioned Joe Perley a Selectman of 12 years, a taxi driver Clark, and a Mrs. Crawford from Hartland, Vt.
Ashley is looking into how preserve the scrolled note from Stevens and how to retrieve the newspaper articles from the bottle without damage. Although the vote for a Special Legislative Session was unanimous, several Executive Councilors took issue with Governor’s Hassan’s timing. The Special Legislative Session to tighten NH’s opiate laws was requested by Governor Hassan on the day before the Executive Council meeting in Newport. Hassan said the reason for the November 18 Special Session was to get the legislation passed before spring. Councilor David K. Wheeler stated he only had three hours to look over all the documents sent by the governor and thought a full hearing would be better. Councilor Joe Kenney said it is better late than never. and said it could have been done last year. Councilor Sununu said the opiate problem has been lacking leadership. One of initiatives is for higher penalties for drug crimes relating to Fentanyl, which is more deadly than heroin but with a lower sentencing structure. A Bronx NY man and two Barre VT residents are each facing the charge of Possession of Crack Cocaine. VT State Police say they stopped Michael Luce 26 of Barre for a minor traffic violation on I-89 in Sharon VT on Wednesday. An investigation with a K-9 unit revealed Luce, Katelin Hunt 21 also of Barre and Jordan Calim 22 of Bronx NY were all in possession of approximately 46grams of crack cocaine. All three were will appear in Windsor Criminal Court on Thursday. Governor Maggie Hassan honored two Newport residents with commendations on Wednesday. The commendations were given to Ella Casey and Kathy Merrill prior to the Executive Council meeting. Casey was honored for her all her years of service to the town of Newport. Kathy Merrill received her commendation for becoming the World Champion of Arm Wrestling and bringing notoriety to Newport.